The EBITDA for the India business has crossed the 15% EBITDA mark, which is good news. The EBITDA has thus grown by 49% versus first quarter CY ‘17, EBIT has grown by 71%, and the EBT has grown by 88%. Company has managed to maintain EBITDA margins as compared to Q1 FY17. In absolute terms, EBITDA has grown 27% versus Q1 C ‘17, EBIT by 35%, and EBT by 46%. In the consolidated results which are a combination of the positive evolution in both India and Europe, there has been a 26% growth in revenue, 36% growth in EBITDA, 50% growth in EBIT, and 62% growth in EBT when compared with the same quarter of last year. The consolidated EBITDA margin is at 13.8% from Q1 CY ‘18 compared to 12.8% in Q1 FY ‘17s. In Europe total impact of the steel price increase that is about 1% on EBITDA margin. Company had around 10 odd Crores of currency impact that came on account of the unit of Bill Forge, Mexico. There is a loan in Mexico which is dollar denomination and the local currency strengthening is what has resulted in this exchange gain. The total revenue size of roughly 1900 Crore per quarter consolidated and for Europe it is 1100 plus and it is 700 plus for India. Impact on margins of commodity price is about 100 basis point. The European operations have hit €140 million mark this quarter. India business now along with Bill Forge crossed the 15% EBITDA margin this quarter. In the Europe, out of the 26% growth, 10% would be currency related and 2% would be the commodity price related, so volume growth is 14%. The India business has grown by 24%. All divisions in India have seen healthy growth. 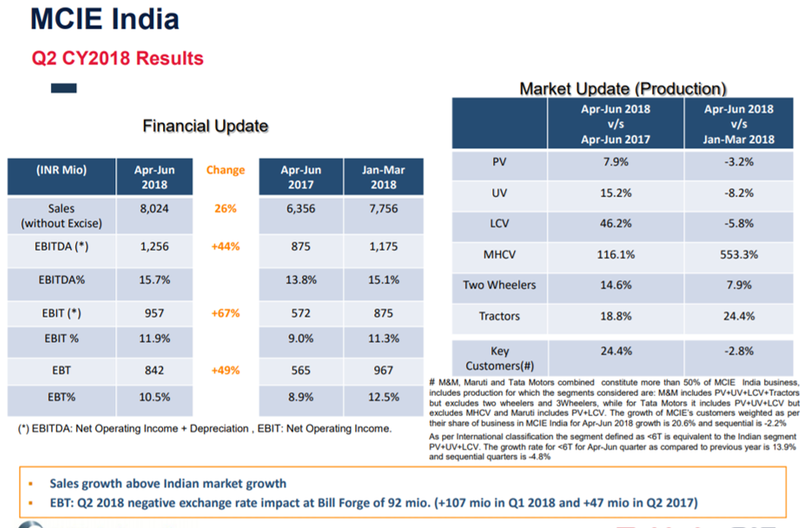 The main drivers of growth in India has been the positive market evolution in UV, tractors, and two wheelers as well as the growth at some key customers. The revenue growth has also been augmented by favourable raw material and scrap prices. The European growth, if you adjust for the currency impact, it is about 16% growth. There has been a 24% growth in the India business and somewhere around 3% to 4% would be because of the Steel price increase, the rest would be all organic and volumes. For the India part, their growth is almost 12%, 4% is explained by the steel cost inflation and the rest is because other key customers have grown faster than the industry. The weighted average growth of key customers would be about 18.5%. They have already started the production, so the jump in Metalcastello is 45% growth in last quarter 2018. Daimler and those companies they are exporting a lot to the States, the truck business in the States is booming right now. This is one of the explanation why company is receiving so many orders from the customers. Second impact is that this technology is quite mature technology and some of our competitors are failing in the market, so there is a concentration in the biggest client, in the most reliable company, so company is getting benefit. The Lithuanian crankshaft business growth is approximately €15 million, it is the growth that are coming from there annualized, and regarding the growth increase in Metalcastello excluding the exchange rate the impact has been 35%. MFE (German Forgings) is growing at 10% and is growing in production. In Euros it is 10%, it is 35 in Metalcastello, and something like 16% in the car passenger roughly. Growth of the Bill Forge in constant is 25% plus. The CAPEX guidance is 5% to 6% of sales that includes both maintenance and growth. The amount of capex for this year is Rs. 4 million. There has been advancements of the gear business, it is fully booked right now and management is advancing 2019 investment to 2018 i.e. moving ahead the investment. For Bill Forge, Mexico, the peak expected revenue is $30-$35 million. The company will start the ramp up of the new customer project in Mexico by beginning next year. The ramp up of current 15 customers will be at the peak volumes by the end of this year, so in 18 months more or less, expectations will reach approximately that level.